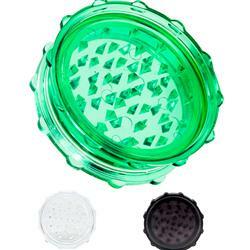 Our plastic extract grinder is great for shredding flower and medical marijuana or cannabis products! 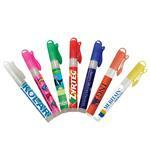 Makes a great giveway for medical dispesaries and as a retail item. Comes with a custom 1-color imprint. Dimensions: 3" dia. x 7/8"
One Color Imprint: 1 3/4" diameter. Full Color Decal: 2 1/2" diameter. Available Imprint Options: Price includes a one color imprint. Inqure about a full color decal- additional charges apply. Box Dimensions: 18" x 14" x 10"